Major Leonard Lowry of Susanville was awarded the Silver Star for gallantry in action January 14 in Korea, according to a report received this week by his sister, Mrs. Robert Aguilar, and his father, Robert Lowry. Lowry was promoted to the rank of major shortly after the award was made. 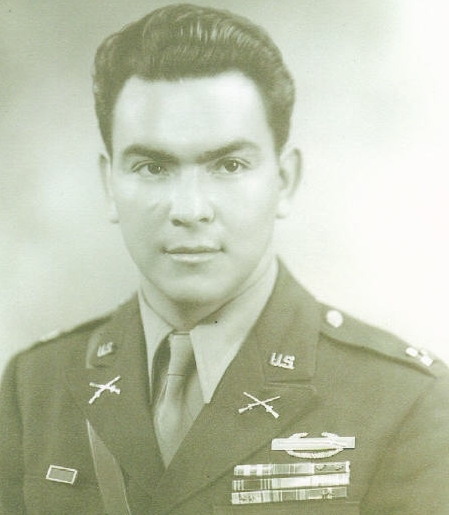 During World War II he served in the South Pacific with the 4th Infantry Division as a second lieutenant, receiving the Silver Star for gallantry in action and also the Bronze Star. Lowry has received four Purple Hearts. His last was won in Korea where he was recently wounded and hospitalized in Japan. Major Lowry was offered the opportunity for leave to the States which he did not accept because he did not wish to be separated from his men, his sister said. Posted by mcouso on . Filed under This Day in History. You can follow any responses to this entry through the RSS 2.0. Both comments and pings are currently closed. I remember Leonard, we had a few talks about every thing. He was a good guy. He and my father Leon Ellena both were in W.W.II ,they both received Silver stars, bronze star’s dad only had two purple hearts and after being wounded the first time,refused a battle field Commission as a leutinet, because he would have been transferred and leave the platoon he trained. So he remained a first Sargent. Those guys were part of a definitely great generation. I never knew Leonard Lowry, but remember these stories of him. A nice tribute to him. Thanks.